This bespoke object is a result of a competitive and very demanding brief set out by Microsoft Research in collaboration with our course and our sister product design course. 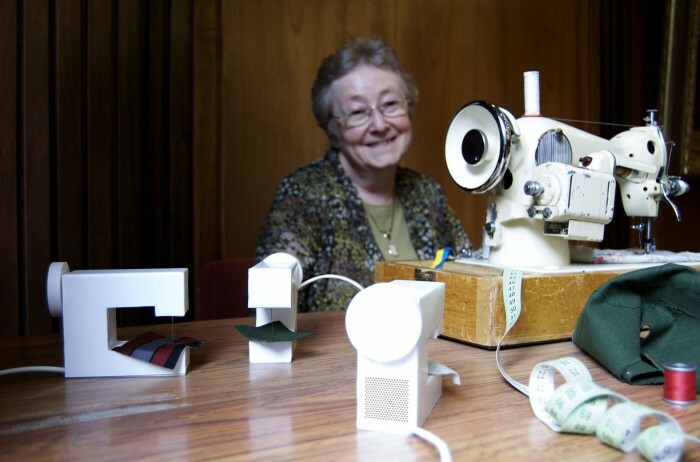 Social Sewing, is a way for my grandmother to socialise with and talk to her friends while sewing through a simple intercom. Her friends are represented by miniature sewing machine avatars that move when their human counterpart presses their sewing machine’s pedal. Our team won the first prize and was invited to develop our experience prototypes into finished products and present them at Microsoft’s Faculty Summit in Redmond, Seattle. I acted as a leader in the team and coordinated difficult design decisions. I also developed Social Sewing’s complex electronics and played an important role in the model making.